As part of the overall exertion to improve Cyprus’ attractiveness as an international business and financial center, and in order to remain highly compliant as a traditional jurisdiction, the House of Representatives on 16 July 2015 passed a number of new laws. One of the changes, introduced the new status of a “non-domicile” (non-dom) individual, with tax exemptions over dividends and interest earned by qualifying “non-doms”. With this amendment, individuals who have non-dom status are no longer subject to Special Defence contribution (SDC) noting, as well, that the new law creates an attractive tax environment for non-doms residing in Cyprus. An individual is considered a Cyprus Tax Resident, based solely on the number of days spent on the island, that is, if they are physically present on the island for 184 days or more during a calendar year; reason being it is not relevant, nor is it a condition that a Cyprus tax resident individual owns or rents accommodation in Cyprus. Non Domiciled Individuals are now exempt from defence tax therefore they are exempt from taxation on both dividends and any passive interest that they receive. In accordance with the Wills and Succession Law, an individual can be considered as domiciled in Cyprus by way of (i) domicile of origin or (ii) by domicile of choice. That is, the domicile received by him / her at birth; or the domicile acquired or retained by him / her by own act / choice, respectively. 1. the individual was NOT a Cyprus tax resident for at least 20 consecutive years prior to the introduction of the amendment to the SDC Law. 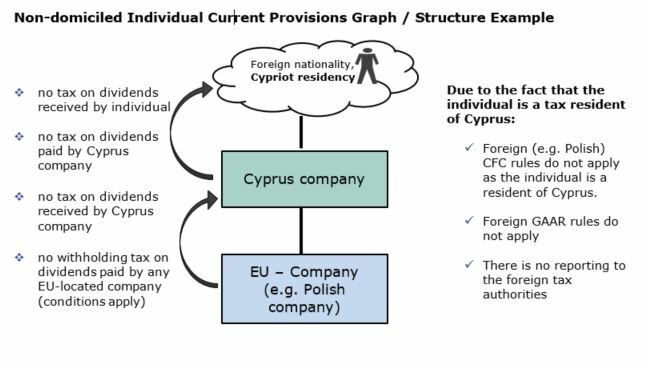 2. the individual has obtained and maintains a domicile of choice outside Cyprus, provided that he was NOT a Cyprus tax resident for a period of 20 consecutive years, prior the tax year of assessment. An individual who has been a tax resident of Cyprus for at least 17 years out of the last 20 years prior to the tax year will be considered to be “domiciled in Cyprus” and as such will be subject to special contribution for defence from the 18th year. the deemed distribution rules on profits from Cyprus tax resident companies will not apply to non-Cyprus domiciled individuals. As such, a Cyprus tax resident individual who is not domiciled in Cyprus (non-dom) will NOT be subject to the SDC in Cyprus on any interest, rents or dividends (whether actual or deemed) regardless of the source, and regardless of whether such income is remitted to a bank account or used in Cyprus. At IBCCS we are happy to support individuals to examine whether they are entitled to the non-dom status in Cyprus. We are also happy to assist with setting-up a required structure and assist from the legal and tax point of view in order to eliminate the potential tax liability and maximise future tax gains. For enquiries contact us by email on info@ibccs.com.cy or call our office in Cyprus directly on +357 222 58 777.